A few nights ago I went out and ended up at karaoke night down at the local bar where a friend was having her birthday party. I downed a few drinks and listened/heckled while chatting with the birthday-girl's boyfriend about the Universal Truth of Karaoke: The secret to a good karaoke performance is to be bad. You must miss at least a handful of notes. You must plow ahead into the chorus one bar early, and recover by singing one bar late until the bridge. As I walked home from the bar swaying gently in the spring air I thought about this universal truth and Frank Klausz. Frank Klausz, whom I have never met, is one of my favorite woodworkers. My first interaction with him was way back in the day when he tested a pre-release pair of the Gramercy carcase saws made by yours truly. He liked them, and thusly I loved him. Fast forward a year or two to his Popular Woodworking three minute dovetail video. 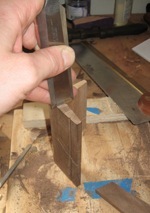 I can get down with Dovetail fetishism, but what I really like about dovetailing is the practicality, speed, and strength of a bang-up dovetail. As I watched Mr. Klausz pound together that three minute dovetail I swooned. I've been looking for a project to use bang-up dovetails on ever since and finally decided on a tool box sized to my most used planes, measures, saws, chisels and rasps. I chose cedar in homage to a tool box my mother owns. I marked out using my die-makers square, and did the initial wasting with a my bow saw. I pared down the tails on the edge of the board to keep from splitting off the pins, but the rest are left as is so they will pound together. On cedar I use a 25 tpi rasp for truing up the bottoms of dovetails. I used to use mithril chisels quenched in dragon's blood and sharpened on a strop of virgin unicorn, but they would occasionally crush the grain, so I switched. I powered through the dovetails and and glued-up using ye olde traditionale parachute corde and 2x4e clampe methode. The box is strong as hell, a little shabby, and fits around my #7 perfectly. I made some corner braces out of a small re-purposed walnut shelf. The corner braces are shaped to hold two trays: one for my collection of Starrett and one for my chisels and rasps. The Starrett shelf will actually be a machined aluminum box, courtesy of Bridget. The lid will hold my Gramercy dovetail and sash saws. With the corner pieces cut I started poking around my box of scrap wood looking for something to spring into place diagonally to hold the corner braces. I found one but just as I was about start gluing in the corners while belting out an atonal third chorus of Knocking on Heaven's Door Eleanor phoned. Death waits for no man. The lesser known foot note of to truism is that death is impatient with female rats. Gandolf, twin sister of Who Cares has died.The tool box, and Guns and Roses, will have to wait. It's rat coffin time. Ben, Your toolbox is ever so much more sophisticated than mine, but it's lovely to have homage paid to the Arthur Mayeno original that sits next to my desk. Nice work Ben. The tool lay-out is balanced and looks good.